I know what you are saying: “Answer the phone? Really? That’s your big advice?” Yes – this IS my big advice, and here’s why. I cannot even begin to tell you how frustrated I get when I call a business and all I get is either a voice automated system or worse it just rings and rings only to leave me with a random voicemail box. Generally by the time I’m picking up the phone and calling a business – I’m pretty close to making a purchase. If I call three places and only one of the three answers the phone and gets me answers to my questions right away – guess which place I’m probably going to be purchasing from? If you guessed the place that answered the phone – you’re right! By the time the other two places call me back (if they do) I’ve probably already made my purchase and have moved on, and they have lost any chance at selling me something. The point is though, and you never know when the owner of a business that would like to work with you is on the other end, and I do not want their first impression of us to be the voicemail box. This one is so simple, but many businesses are failing in this department, so start answering the phone all the time, and I promise you’ll be far ahead of the game! Do you watch “The Office”? If you do – you’ve probably heard Michael Scott talking to his team about getting things done ASAP AS POSSIBLE. This is how soon you should reply to leads. (if not even sooner than that!). Again, if someone is bothering to send you an E-mail through your website, or call your phone number – they WANT TO BUY YOUR PRODUCT! Moreover, in case you haven’t noticed – people (myself included) have become impatient! When they send in an E-mail request for information, they do not want an answer next month, next week or even tomorrow – they want an answer RIGHT NOW. Get them their answer right away, and you’ll be well on your way to another sale – I promise! There are SO MANY BUSINESSES failing miserably at this one and the few that are responding well – are blowing up with sales. I’m assuming if you’re reading this – you would prefer to sell more. Just hearing those words can help to diffuse many situations. The fact of the matter is, when you own a business you will have to deal with unhappy customers/clients no matter how hard you and your team work to avoid that. So if you have someone who is rationally or irrationally unhappy with your business my recommendation is you do everything you can to make them happy. If they want their entire order for free and you don’t think they should get that – then offer to fix the problems they did have, or offer to give them a gift card for future services. Whatever you have to do to make it right (even with the crazy people!) will be in your best interest. How many times have you gone to a businesses website in June and saw right there on the homepage something about the Christmas sale from the previous year? This makes businesses look not with it and very outdated. The same thing stands for your social media. When I go to a business’ page and see they haven’t posted for months my initial reaction is they either a) are out of business or b) don’t have it all together – call me a millennium or what you want, but I’m 29 and buying things – so take heed! Again, this is an obvious one – but I find myself needing to remind me to do this too. At least once a week I’ll make sure to include a “Thanks – I appreciate it” in my E-mails to clients. If you have customers that are regular make sure you throw them a percentage discount randomly here and there – and when you say the total price and they look up confused – tell them you appreciate their dedicated business. So what if you got a new logo a few months ago and your website is still your old logo, but your business cards have your new logo – and your letterhead has no logo? Um….Not so what! People notice inconsistencies such as this. Probably not – so why have your business looking anything close to disheveled either? Make sure everything is giving the same message with the same look. There’s a reason large businesses are adamant about their logo usage etc…it’s because they realize the value. Making sure everything matches – so do it is free! A lot of this indeed is comfortable – yet some can be time-consuming. That’s where your favorite Des Moines Advertising Agency can come in. If you don’t have the time – we do – because it’s all we do, and we love it! Let us help protect your brand, and leave you to the answering the phones and responding ASAP to potential buyers! See…easy as 123! For people who are just getting into blogging, it can be a difficult task if you do not know some tips and tricks. The truth is that blogging can be a fun and useful hobby if you do it in the right way. If you want to have a successful following, then you need to stay as consistent as you can. You can schedule days that you will write a blog post. This will also help you to create content continuously. It is not the hare that wins the race, but the turtle who consistently moves forward. The truth is that while blogging can make you a fortune, there are the untold stories of many more who failed. If you do it for love, then it will help you to stick it out even when the going gets rough. If you are looking for an easy way to make money, then know that there is no easier way then using Adsense. It is such a useful way of generating money because it requires no work on your part. Besides useful content. You may think that the money earned initially is laughable, but there are people out there who are making a full-time income on Adsense alone. The great thing about blogging is that you are allowed actually to have a personality. In fact, if your personality is magnetic enough, it will even attract followers. This is a saying that internet marketers live by. The internet is already full of content that is ‘average.’ It does not need any more average content, and anyone can make average content. If you write things that are genuinely useful to people, then you will develop a following. Start by looking for a challenging problem in your niche and try solving the problem. It is these problems that people will genuinely care about. Like everything else in life, you will not last long if you do not love what you do. 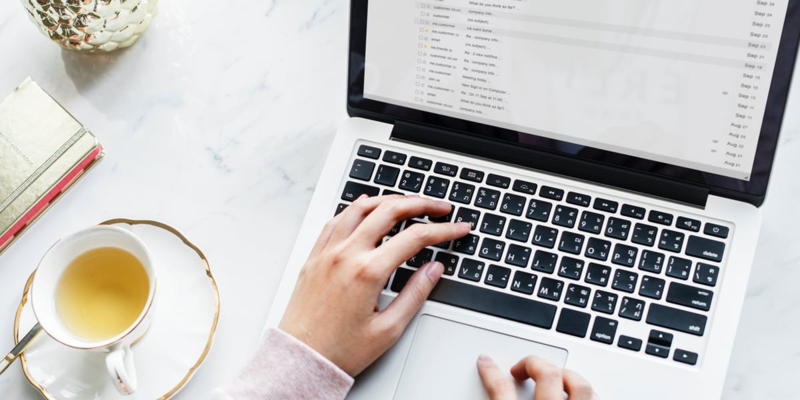 In the words of Steve Jobs, “Any sane person would give up if they don’t love it.” Being passionate helps you to overcome the difficulties that go with blogging. This does not necessarily mean a topic that you love. To make money off of a niche, you need to make sure that the niche is profitable. If people are not interested in what you are blogging about, then you are not likely to make anything? However, do pick a topic that you will enjoy blogging about. Maybe a topic that you always wanted to learn about. This will ensure that the process is still highly enjoyable. Blogging can be a fun hobby, and what is also good about it is the fact that it can be a profitable hobby. The important thing is that you do not give up, and eventually you have developed a nice cash flow. As one of the major influential web hosting companies of the past two decades or so, it should come as no surprise to anyone that the folks at A2 Hosting have such a sterling silver reputation when it comes to helping people, organizations, and businesses build their online presence. For more than 15 years now, the A2 Hosting company has been one of the gold standard companies in the entire web hosting industry. A2Hosting offers a fantastic blend of power, performance, and price that cannot be topped, and it’s a big reason why they continue to be one of the most highly recommended web hosting companies around. At the end of the day, however, you’re going to have to do your own research and due diligence to determine whether or not A2 Hosting is the right hosting operation for you. Hopefully, by the time you’re done with the inside information below in this quick A2Hosting review you will have a better expectation of whether or not A2Hosting has what you’re looking for or if you should continue to look elsewhere. There are reviews about A2Hosting that give additional details that we don’t cover here. Originally founded back in 2001, A2 Hosting established its base of operation and its first data center in Michigan (the central United States region) and provided lightning fast speed and high quality performance to customers throughout the US region. Since then, they have rapidly expanded operation throughout Europe and Asia (with data centers in Amsterdam and Singapore), providing fantastic speed and performance throughout the rest of the world – all while remaining wholly privately owned and operated, as opposed to owned by the major hosting conglomerate EIG. You won’t ever have to worry about the nightmare support and that hosting companies owned by EIG are known for throughout the industry, and you won’t ever have to worry about purchasing web hosting from an organization that is little more than a reseller of some other platform with a white label slapped on top of it. This does elevate the price of A2Hosting a little bit (and only a little bit), but in exchange for that slightly higher price tag you are going to get a fantastic bump in performance, power, speed, and security that you just wouldn’t have been able to enjoy otherwise. On top of that, you get robust service and support, the ability to effortlessly upgrade and scale your web hosting solution, and a host of other benefits provided directly from A2 Hosting that you won’t get from any other hosting level without paying a small fortune along the way. 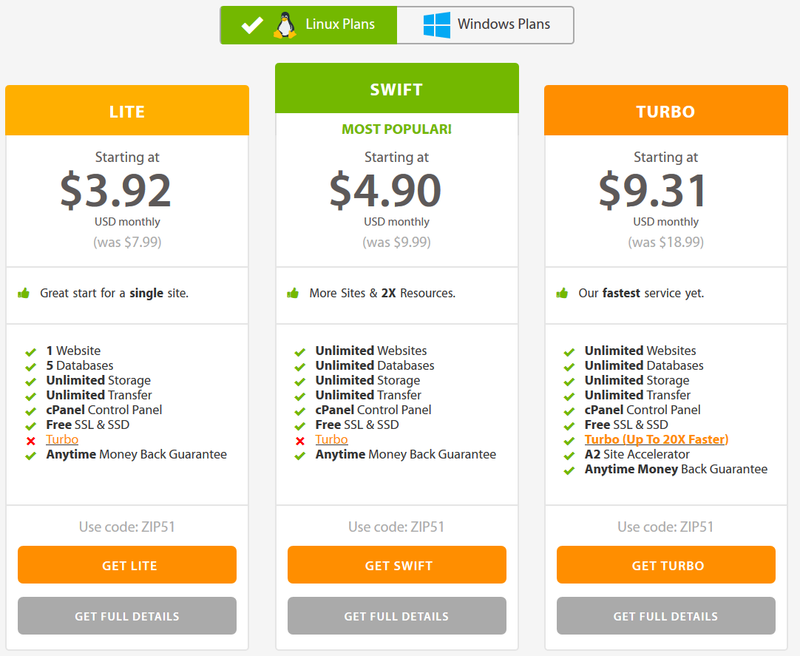 You are also going to be able to take full advantage of Turbo services directly from A2 Hosting. This elevates the amount of drop in Apache replacement you’re going to be able to countdown from your backend system, allowing your pages to load 20 times faster than they would have compared to standard or traditional web hosting. This is all backed up by CloudFlare technology, the cutting edge in keeping your site as lightning fast as humanly possible. On a regular basis, the A2 Hosting platform is fully optimized from top to bottom, with new hardware being implemented across the different data centers and new solutions being provided to customers of every level. Regardless of whether or not you are taking advantage of Shared hosting, VPS hosting, Cloud hosting, or Dedicated server hosting makes no difference. You’ll be able to take full advantage of the optimization that A2Hosting rolls out to across their entire platform and you’ll be able to enjoy all of the benefits they make available without having to spend any extra money. A2Hosting is also very, very friendly with new discounts, coupon codes, and promotional offers for new clients and customers as well as veterans of the A2 Hosting service. Prices are already pretty low compared to the industry standard (though they are a little bit higher than your entry-level web hosting packages), but with the A2 Hosting discount codes, promos, and coupon offers you’ll be able to save a tremendous amount of money on your hosting while getting better hosting at the exact same time. Finally, something you’re going to notice right out of the gate about the A2 Hosting platform is that they don’t play any games when it comes to providing the best service and support to their customers (something that cannot be said about a lot of the competitors in the web hosting space). The 24/7 customer and technical support services offered by this company are legitimately 24/7, and are available every single day of the year. You’ll be able to get help from someone that speaks English natively, and you’ll be able to get your issues resolved with lightning like speed – all with the help of clear technical support and service agents that can get you up and running again faster than you ever thought possible. Customer service is just as reliable, just as helpful, and just as accessible. This makes A2Hosting the clear choice for individuals serious about utilizing the best web hosting packages around today! One of the very first steps to creating a successful online business is learning how to create a website. This can often seem daunting for beginners, but it doesn’t have to be. All you have to do is take it one step at a time, then before you know it you have a website up and running so you can get started with your online business. You can use a well-known registrar like Go Daddy, and the price will be pretty inexpensive when you consider that you’re paying for an entire year. You can try to find a domain with the exact keyword phrase to improve your rankings in the search engines, but this is not necessary. For a long-term website, it may be better to choose a good “brand” domain name anyway. Just like you store files on your local hard drive, your website will have to be stored on a web server somewhere in cyberspace. The good news is that hosting is inexpensive these days, and you can usually get started for somewhere around $5 – $20 a month. The big companies like Hostgator provide 24-hour support which comes in handy if you ever get stuck on something. Once you have your web hosting space, upload your website to the server. You can choose a WYSIWYG editor to help you create HTML files quickly and then upload these files to your server. 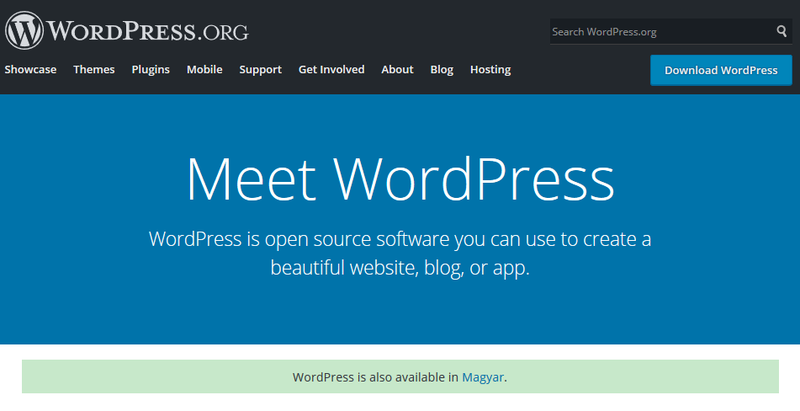 On the other hand, you can use your web hosting account to install WordPress software instead. 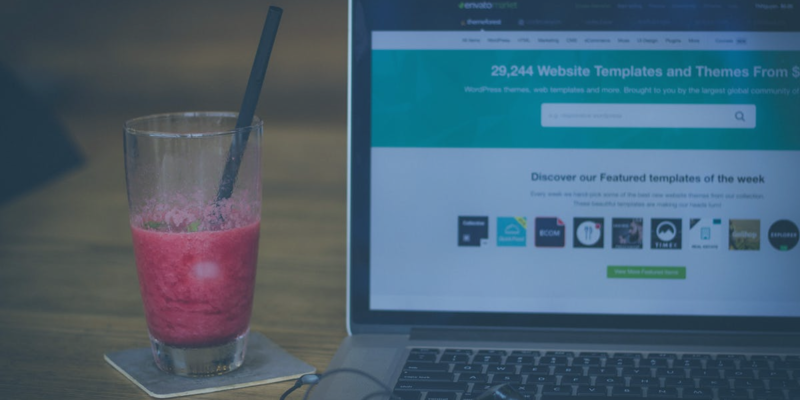 Even though there is a slight learning curve here, you’ll soon be able to focus 100% on adding content to your website without having to learn HTML or CSS. 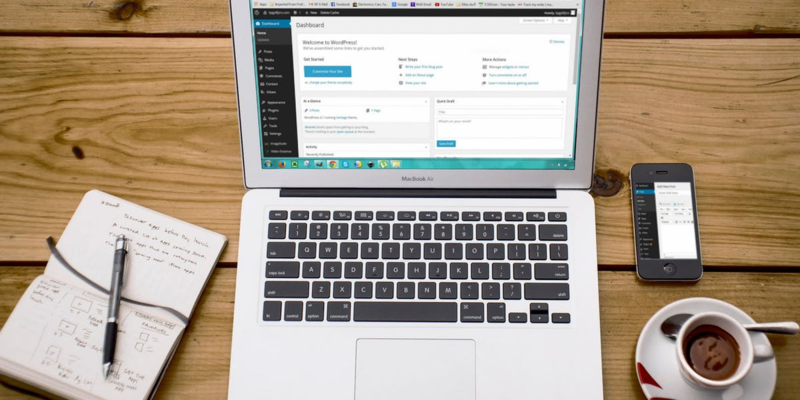 WordPress is an option to consider as a content management system. Once your website is up and running, you merely add articles that are relevant to your niche. Ideally, you would perform keyword research so you can know precisely what phrases you want to rank for in the search engines. You would then write some interesting and helpful articles related to these keyword phrases. Nowadays, more extended, higher quality content has a better chance to rank in Google over the long-term. You can get traffic to your website in a variety of ways, including both paid and “free” advertising methods. For most people on a tight budget, you want to focus on search engine optimization and content marketing. In other words, you’ll build links to your website to help it rank better in Google and other search engines. You’ll also submit content like articles and videos to many different external websites and social media networks to drive traffic back to your website. Once you have traffic coming to your website, you can then try to make money in different ways including selling your information products, promoting affiliate products, or selling physical products related to your niche. There are lots of ways to monetize your website as long as you did your research in the beginning and picked a profitable market.